By Elizabeth Mitchell Armstrong, Ph.D., M.P.A. Last month the Centers for Disease Control ramped up their warnings and released a new campaign to discourage any woman of reproductive age who is not on birth control to abstain from drinking any alcohol at all, along with those who are currently at any stage of pregnancy. This report was quickly met with a backlash from many avenues, questioning the recommendations, the wording and the overall message. In a two part post on this topic, Elizabeth Mitchell Armstrong, Ph.D., M.P.A takes a look at what is known about the causes of fetal alcohol syndrome (Part One - today) and offers a suggestion for what the message should be to reproductive age women when it comes to alcohol consumption (Part Two on Thursday). Dr. Armstrong is the author of a book on Fetal Alcohol Syndrome, where she examines the topic through the lens of a sociologist. - Sharon Muza, Community Manager, Science & Sensibility. Pregnant women have long been subject to a wide range of warnings and admonitions about their actions during pregnancy, often based on superstition or fear. 150 years ago, medical journals were full of articles about the "doctrine of maternal impressions," a theory that held that a woman's emotions and experiences during pregnancy could leave a permanent mark or imprint on her child. A woman who succumbed to a craving for strawberries might give birth to a child with a birthmark. A woman who saw a rabbit during pregnancy might have a baby with a harelip. A woman who gazed at something speckled or spotted would give birth to a child with freckles. And a woman who experienced some kind of shock or extreme fright while pregnant and touched her own face in response would have a baby with a birthmark in that same spot. The effect could be mental as well-a grieving woman would give birth to a melancholic child, for example. Women's emotions during pregnancy were translated into physical marks or manifestations on their children. Women themselves-through their thoughts, feelings and deeds, especially their untamed appetites-were believed to influence directly the developing fetus in the womb. The doctrine of maternal impressions was a way to make sense of unexpected and untoward outcomes. For instance, a bright red birthmark-what we today would recognize as a hemangioma-was attributed to the mother's consumption of berries-or even just her unrestrained craving. The doctrine of maternal impressions was also a way to express social and moral ideals for how women ought to behave. That was then; this is now. We understand so much more about the physiology of pregnancy and fetal development, though human reproduction remains inherently uncertain. Our desire for control is, if anything, stronger than ever, but our advice for pregnant women today ought to be based on evidence, not superstition. Women face a long list of "do's and don'ts" during pregnancy-and one of the "don'ts" expressed most forcefully in contemporary American society is the prohibition against drinking any amount of alcohol during pregnancy. Since fetal alcohol syndrome (FAS) was first described in the medical literature in 1973, public health agencies and doctors in the United States have warned women not to drink alcohol at all during pregnancy. But the Centers for Disease Control (CDC) recently extended that prohibition to encompass not just pregnant women, but any woman of reproductive age who is not actively using contraception, claiming that "sexually active women who stop using birth control should stop drinking alcohol" (CDC, 2016a). This recommendation immediately caused a great deal of consternation-and generated considerable anxiety, concern, criticism and even derision (Macmillen, 2016; Petri, 2016; Skenazy, 2016; Kukla, 2016). Women who had consumed alcohol between the time they conceived and the time they realized they were pregnant began to wonder if they had unwittingly harmed their future baby. Could a glass of wine with dinner or a happy hour cocktail really cause brain damage in their future child? In the days and weeks since the CDC issued this warning, social media lit up with questions, complaints and even parodies of this new addition to the long list of things women should or should not do when they are pregnant-or even "pre-pregnant" in the language of one CDC official. Why did the CDC make this recommendation now? 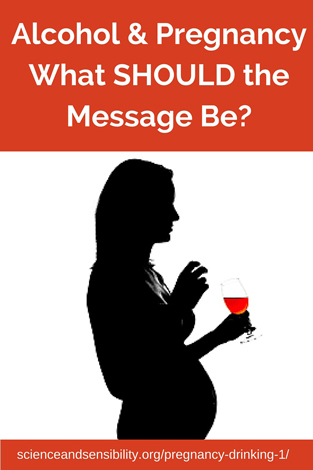 What is the evidence base for the recommendation that women should not drink at all if they are or might become pregnant? Let's first consider the diagnosis of fetal alcohol syndrome (FAS), which was first described in the medical literature some 40 years ago. The diagnosis is based on several criteria: certain craniofacial anomalies, central nervous system deficits, and low birth weight and growth retardation after birth, along with confirmed prenatal alcohol exposure (Stratton et al. 1996). The diagnosis was confined to children born to women who were chronic alcoholics, women whose own health and wellbeing are severely compromised by their drinking. There is no evidence that FAS occurs in babies born to women who drink occasionally or moderately during pregnancy. Indeed, even among women who drink heavily throughout pregnancy, only 4-5 percent of their babies will be born with FAS (Gray and Henderson, 2006). Moreover, FAS typically occurs in concert with a host of other factors that raise the risk of an adverse outcome, including smoking, drug use, poverty, advanced maternal age, environmental exposures, poor nutrition, maternal depression, and lack of social support (Abel 1993). There is also evidence that patterns of drinking behavior matter: binge drinking in particular is associated with neurodevelopmental deficits (Henderson et al. 2007). Researchers hypothesize this effect is related to peak blood alcohol content (BAC) levels reached-with more drinks in a concentrated period of time leading to higher BAC levels. What really matters in terms of the effect on the fetus is the peak blood alcohol content reached-and this is why binge drinking is of particular concern-consuming large quantities of alcohol over a concentrated period of time appears to be a greater risk than having one drink every day, for example. In other words, it's not just how much a woman drinks, but how she drinks-at what pace. To summarize what we know about the risks of alcohol exposure in utero: FAS occurs only in babies born to women who drink heavily during pregnancy (and only in a small percentage of them at that), but women who consume large amounts of alcohol over short time periods may also be at risk for having children with alcohol-related neurodevelopmental disorders (Henderson et al. 2007). Abel, E.L. (1993). Fetal alcohol syndrome and fetal alcohol effects. New York: Plenum Press. Armstrong, E.M. (2003). Conceiving risk, bearing responsibility: Fetal alcohol syndrome and the diagnosis of moral disorder. Baltimore, MD: Johns Hopkins University Press. Gray, R. & Henderson, J. (2006). Review of the fetal effects of prenatal alcohol exposure. Report to the Department of Health. Oxford, UK: National Perinatal Epidemiology Unit. Henderson, J., Kesmodel, U. & Gray, R. (2007). Systematic review of the fetal effects of prenatal binge drinking. Journal of Epidemiology and Community Health, 61, 1069-1073. Lyerly, A.D., Mitchell, L.M., Armstrong, E.M., Harris, L.H., Kukla, R., Kuppermann, M. & Little, M.O. (2007). Risks, values and decision making surrounding pregnancy. Obstetrics and Gynecology, 109,979-984. Stratton, K., Howe, C., & Battaglia, F. (Eds.). (1996). Fetal alcohol syndrome: Diagnosis, Epidemiology, Prevention and Treatment. Washington, DC: National Academy Press. Waggoner, M. (2013). Motherhood preconceived: the emergence of the preconception health and health care initiative. Journal of Health Politics, Policy and Law, 38, 345-372. About Elizabeth Mitchell Armstrong, Ph.D., M.P.A. Elizabeth Mitchell Armstrong, Ph.D., M.P.A., is Associate Professor of Sociology and Public Affairs at Princeton University. She studies the history and sociology of medicine, particularly pregnancy and childbirth, public health, and medical ethics. 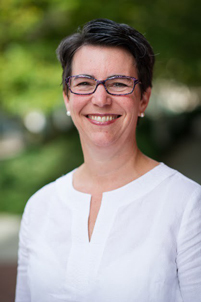 She is the author of Conceiving Risk, Bearing Responsibility: Fetal Alcohol Syndrome and the Diagnosis of Moral Disorder (Johns Hopkins University Press, 2003), the first book to explore fetal alcohol syndrome from a sociocultural perspective and to challenge conventional wisdom about drinking during pregnancy. She has also published on mass media attention to disease, family planning, medical mistakes, adolescent motherhood, prenatal substance use, home birth, and the sociology of pregnancy and birth. She is a past member of the Board of Directors of Lamaze International and she currently serves on the Lamaze International Certification Council. She is the mother of two.